3.8.3. Will a Lisa 2/10 I/O board work in a Lisa 2/5? It is sometimes desirable or necessary to use the I/O board from a Lisa 2/10 in a Lisa 2/5, often due to corrosion damage resulting from battery leakage. Although most of the I/O board works fine with a straight swap, the floppy disk does not. Hence some modifications are necessary to restore floppy disk functionality when a 2/10 I/O board is used in a 2/5 with a 3.5" floppy drive. All of these modifications are performed on the Lite Adapter, located in the drive cage of the 2/5. These modifications should be reversed to restore floppy drive functionality if a 2/5 I/O board is reinstalled. - add a jumper wire from J1-20 to U6-8. J1-20 is the pin closest to "1983", and pin 8 of U6 is the one connected to a thin straight trace; suitable connection points are indicated by yellow circles in the picture below. - add a jumper from J2-24 to ground (eg. to J2-13) pin 24 is second from the end farthest away from U2, and pin 13 is closest to, and in line with, J1; suitable connection points are indicated by blue circles in the picture below. Since it programs the floppy drive controller, the I/O Board ROM must match the I/O Board, hence the 2/10 board should always have a rev 88 2/10 I/O board ROM (the 400k or 800k version to suit the floppy drive). As a result, the Lisa will report that it is a 2/10 when a 2/10 I/O board is installed, regardless of any hard-drive attached. Although the icon changes, the parallel port hard drive is not influenced by the 2/5 or 2/10 designation except in the case of Xenix. 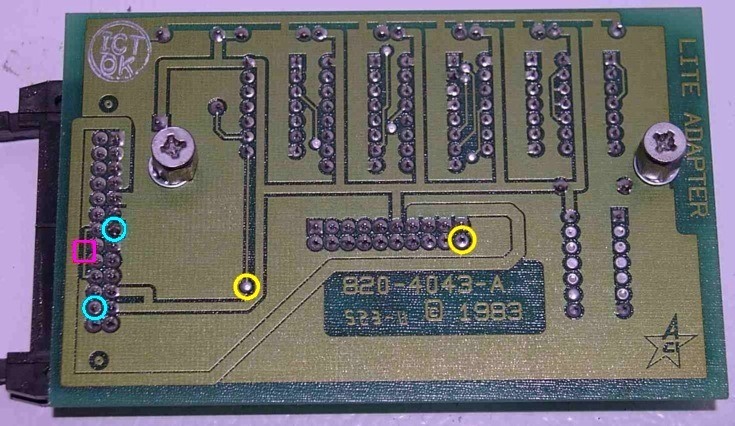 The Lite Adapter which is present in the drive cage of a 2/5 has two functions: modify the speed signal for the 400K drive, and re-map the 26 pin connector used by the twiggy drives to the 20 pin connector used by the 3.5" drives. When the 2/10 I/O board is substituted, the correct speed signal is already generated by the I/O board, so the alterations made by the Lite Adapter interfere. However, the Lite Adapter is still required to re-map the connectors. The 2/5 and 2/10 motherboards are different, and require different internal cabling. If entire card cages are swapped, the floppy drive connectors are incorrectly wired, so the floppy drive will not work. The 2/10 internal parallel port will not work either. The keyboard and power switch are still correctly wired, so a cage swap can be used if the floppy drive and Widget are disconnected. The main difference between the I/O boards is the floppy disk controller. The 2/5 board was designed for use with two 5.25" Twiggy drives, so implementing the 3.5" floppy required the addition of the Lite Adapter that is installed in the drive cage. The 2/10 board was designed with a single 3.5" floppy in mind so no additional hardware is required. There is some evidence that it was designed to permit backwards compatibility with Twiggy drives. However, the ROM that would be required for Twiggy drives to work with a 2/10 I/O board is unknown. Other minor differences are the battery and associated circuitry (missing on the 2/10 board), and the clock rate of the parallel port VIAs, which is nominally faster on the 2/10 board (1.25 MHz vs CPU clock/10). The stock CPU clock is 5MHz, so the VIAs in a 2/5 are nominally clocked at 500 KHz. However, when an original XLerator is installed in a 2/5, the VIA clock rate rises (ie. to 1.6 MHz with the 16 MHz XLerator), while the VIA clock rate in a 2/10 remains constant at 1.25 MHz. The clock rate of the VIA has a small effect on the speed of the parallel port, and may or may not affect the pitch of sounds generated by the speaker depending on the software in use. One can identify the internal cabling as 2/5 by the two 26 pin ribbon cable connectors, while the 2/10 ribbon cable has one 26 pin connector and one 20 pin connector. 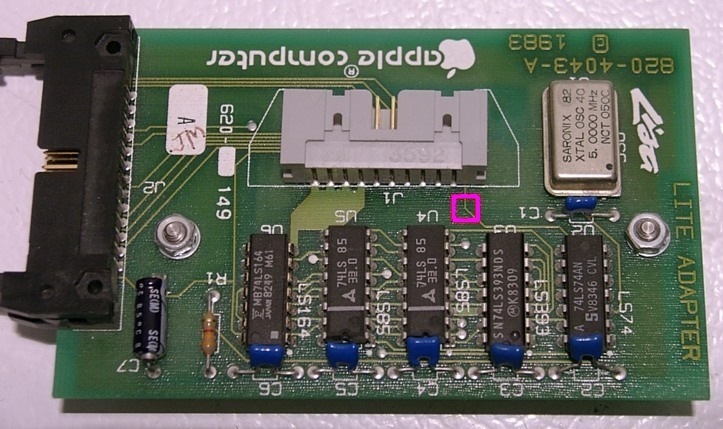 One can identify the motherboard of a 2/5 by the existence of a parallel port on the back panel, while a 2/10 motherboard has both interrupt and reset buttons but no parallel port on the back panel. One can identify a 2/5 I/O board by the existence of two medium sized chips near the red ejector-latch, while the 2/10 I/O board has three medium sized chips near the red ejector-latch.